Forward British 19th C, except portraits, Continental European after 1800, London: Artists and Subjects 59 comments Does anyone recognise this location? Could the port in the background be identified by the prominent church tower and by the distant hill at the right? Could this be related to ‘Summer Evening’ exhibited by Webb as no. 315 at the Liverpool Autumn Exhibition in 1883, priced at £30? There is writing on the sail that is in shadow, which might help to identify the port. 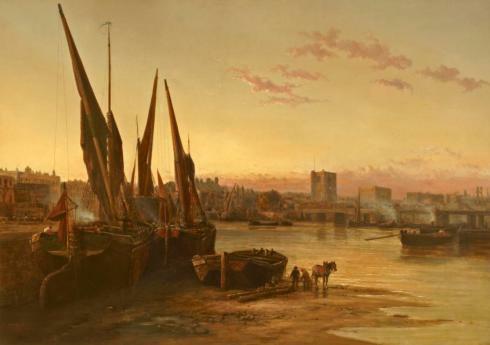 There are similar views by Webb on Art UK, including ‘A Barge on the Texel’, 1878 (National Maritime Museum) and ‘View of Mayence, Germany, with Market Boats’, c.1871 (Laing Art Gallery). A high-resolution image will be added as soon as possible. The buildings on the riverbank look very similar to a painting by James Webb of the riverside at Chelsea painted by him in the 1880s. To add to my last comment. The tall, square building on the opposite bank has a good resemblance to Chelsea Old Church. I have attached a jpg version of the PCF's tiff file, because in this instance it should be good enough. If anyone would like to see higher-resolution, please let me know. I also doubt its unembanked Thames at Chelsea, for a variety of reasons including the smaller boats (none obvious Thames types, even if Dutch boiers got there) and the absence of the bridge shown in the Chelsea view copied by Wendy Howard three items above. Webb was born in Chelsea but the level of conurbation he shows in that picture at least must be into the 1860s. PS to previous: if a sunset the view should also be west, or just north of west by the time the sun hits the horizon in summer. If it were Chelsea, the view here is more northerly and still not yet sundown - albeit that might just be imaginative licence. With regards to whether the painting represents Dordecht or not, I have to say here that it is a painting, not a photograph. Artists paint what they see, or what they THINK they might be seeing Making a sketch in hazy light, and then a complete painting an a studio, leads to innacuracies. This was the Romantic style of painting. If we were looking at a Monet here, completed on the spot, it would contain far less detail, but probably be a much more relieble record, because the artist would not attempt to draw in details of windows that he could not actually see. As the Ruisdael painting seems to indicate, although the towr has two clocks projecting from the top, they merge into a single shape when viewed at certain angles, and would do so more in hazy light. Our man was not at all particular about accurate representation of forms. That is evidenced by other works. 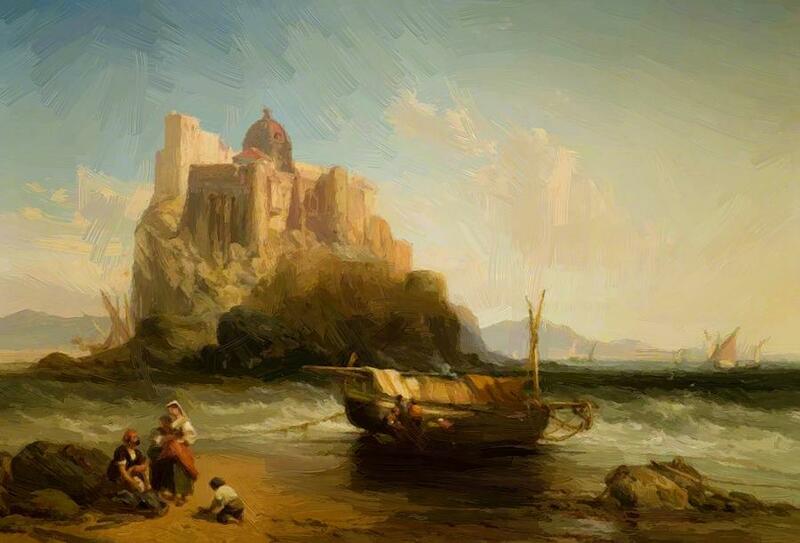 I looked at a number of paintings of the Castle at Ischia and found Webb's to be by far the most romanticised and the least accurate in terms of both proportion and detail. My conclusion woud be that th present image may be part of a series of this region, and that unless another exceptionally large tower comes to light, it could probably be assume to be a loose representation of Dordrecht. Maybe there is another nearby that I haven't found yet. I will look further. 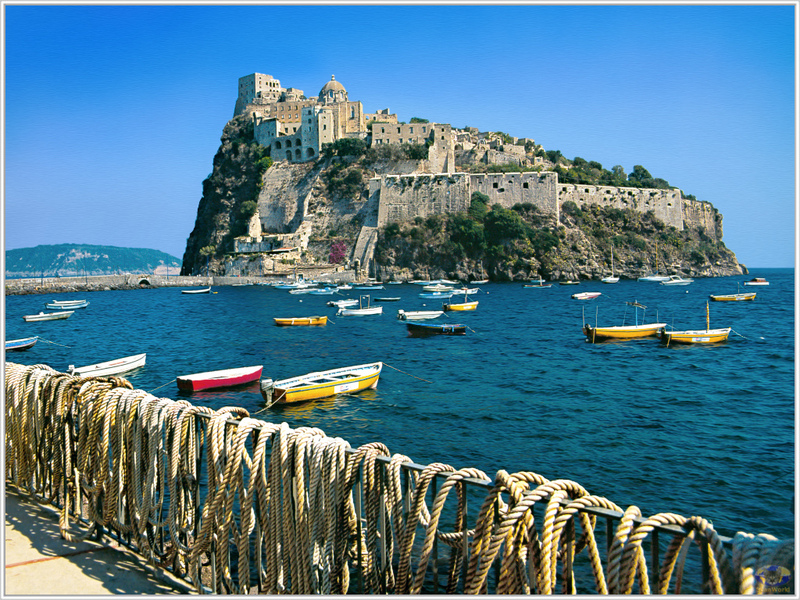 In the meantime, the photos relate to Webb's loose representation of Ischia. Portsmouth viewed from Gosport? Could the "church towwr: be the cathedral which has changed a lot over the years? To the right of that, possibly the hotwalls. Just a guess, hard to see a clear image when viewed on a mobile phone. Did the Royal Garrison Church , a 13th century building , have a tower like this before the firebomb of 1941? Could the future cathedral be hidden from sight by the ships? It is not Portsmouth; that has all sorts of distinctive markers which are simply not present. Thank you for your comments about the location of the composition. We very much appreciate your efforts, enthusiasm and expertise! I have attached enlargements in case they could help, although I think these details are probably visible to anyone who has looked at the jpeg of the whole scene (5th comment in the thread). 'DORC'T /No 3' on the sail -i.e. Dordrecht - suggests its riverine and within reasonable reach of there, Though apart from the windmill just right of the sail the buidings do not looks notably Dutch. 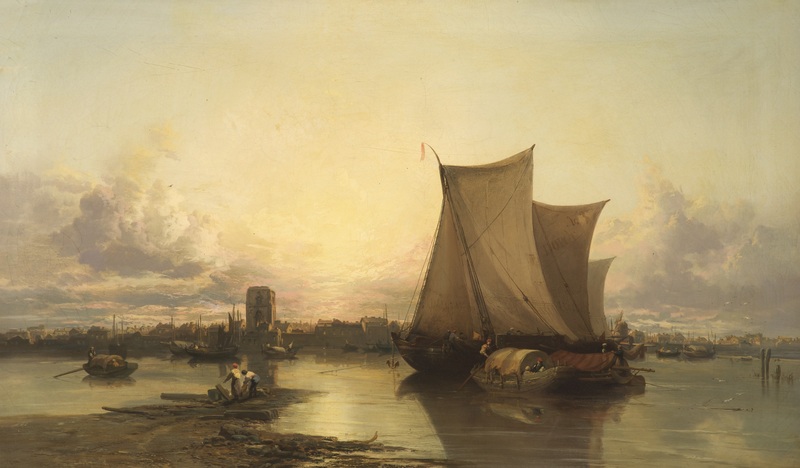 Attached please see an image of a James Webb painting, sold at auction in 2009, of a view of Dordrecht at sunset, signed and inscribed by the artist 'Dord'. Based on a comparison of the two images I think there is a good case that 'our' Evening Scene is also a view of Dordrecht. Was the church tower rebuilt in the late 19th century? If it were the Grote Kerk from across the water the view would also be looking south-east which might just be credible for daybreak but not evening. Is / was there an alternative waterfront Dordecht church visible in a western aspect? I can't see one. Quite so; but it's a case of 'evidenced suggestions, please'! Webb is a good painter but he does take liberties: its really just a matter of being sure he is doing so before coming to at least a provisional conclusion. 1. Do we know how far Dordrecht vessels of this type travelled? 2. Are there surviving church towers in the Netherlands comparable in style to this one? It is very difficult to see how the Grote Kerk could have looked like this at any time? 4 River towns east of Dordrecht much damaged in WW2 include Nijmegen and Arnhem , but further east the waterway might not be wide enough for consideration -Roermond, Maasstricht, A specialist on the Dutch waterways , Maas, Waal, Roer, Merwede etc might be able to help with useful information. Would vessels from Dordrecht have travelled to Walcheren to places like Vlissingen and Middelburg or even further up the Scheldt beyond Antwerp? As you can see, my ignorance of travel on tidal rivers is extreme. It would be helpful to have well-evidenced suggestions from anyone in, or who knows, this area of the Netherlands better. If nothing turns up after a reasonable time then my suggestion will be to adjust the title to something like 'Evening scene: Dordrecht boats off a Dutch river townscape' and wind things up that way as an interim solution. - but are we sure that the location is Dutch? There are some similarities to the tower of the Grote Kerk Veere so the architecture may be consistent with that part of the Netherlands. Indeed it does have similarities. Should we check the other churches on Walcheren and the area? Hellevoetsluis is the town at the mouth of one of the waterways directly connected to Dordrecht. It is much altered. Engravings may provide the answer as to our tower's whereabouts. Has any one consulted the Dordrechts Museum? or the historical museum of Rotterdam? The style is sometimes referred to as Brabantine Gothic. Sint Livensmonstertoren in Zierikzee is an over-sized example. That would be fine too, but the sign-off is more with the 'British post 1800' group leader than 'maritime subjects' and I'd be inclined to leave it in play a bit longer to see if the location issue can resolve. That really does need to be by convincing visual-evidence attachments to get us anywhere further. The attached composite might give a helpful view of this scene. The boatmen's red caps, the striped covering on the small barge, the configuration of the sails, the distinctive bend on the mast tip and the red flag all are very similar. The work on the left has been identified as Dordrecht by James Webb. Working on the basis that they are the same place, the blow-up on the left is interesting. It has Dutch gables on some of the mid-ground buildings and the masts of deep-water ships in harbour beyond the church which suggests a rather more complex port topography than just the river in front. 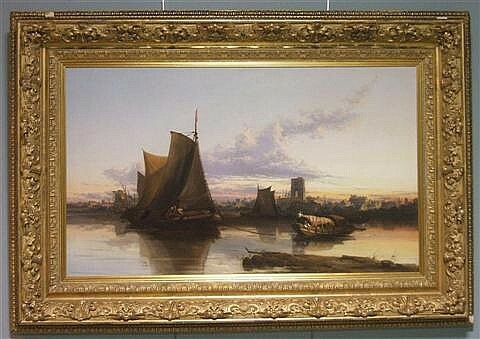 Attached is a tonally lightened version of the above-posted Dordrecht painting by Webb. These clock faces have appeared in fairly much every painting and engraving of the church since the 1660s, and can be seen on any Googled image for the building. The squat church depicted is this discussion is more in keeping with the style of Veere church in Zeeland. Kieran, there are only two clock faces now, as well as in Boudin's painting of 1874. Was the tower ever damaged and then restored with only two instead of four clock faces? Unless Webb took liberties, neither the tower in this picture nor in his view of Dordrecht linked above can be Dordrecht's Grote Kerk based on the greater number of windows on each side of its tower. Jacinto, I am unsure as to what you mean by only two clock faces. Every painting, engraving and photograph that I have seen, from 1660 to today, including a street view from Google maps and Google Earth shows that there are four clock faces on the top of the tower, facing north, south, east and west. Have you an image with only tow faces? As for Boudin, he only shows two of the four faces as this would be all that could be seen from his vantage points. This certainly is the case in his work of 1884. I was misled by some photos taken at an angle that suggests only two faces, but now I have found other photos that appear to show four. However, the problem with the number of windows remains. Difficulties in identifying the exact location may be due to Webb combining features from a different drawings that he made , which he then used in the studio some time later. He is known on occasion for taking liberties with topography and as far as I know, none of his sketchbooks are in public collections . They may not survive. In trying to progress this I just repeat that we need corroborative evidence for where it is, not where it is not , which - at least in any realistic sense - is not Dordrecht. The church makes that clear: it's not just details such as the well-known four clocks of the Grote Kerk and its far more complex fenestration, it's also the latter's massive overal 'cathedral' scale - compared to which the church here is a minor one. 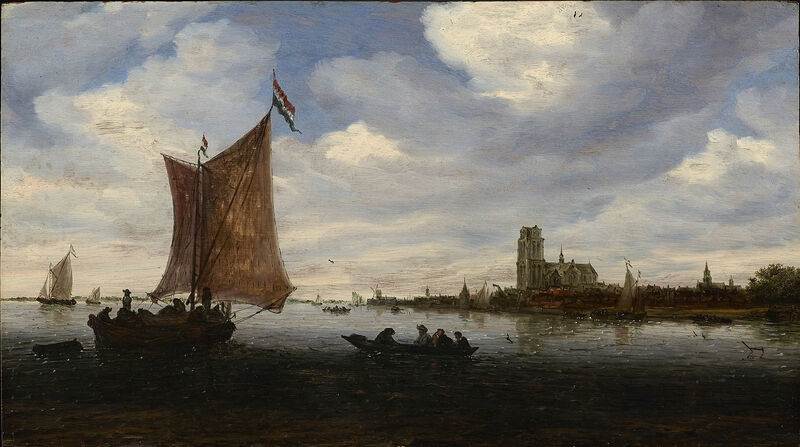 Assuming, just for the moment, that this painting did depict the Grote Kerk at Dordrecht, whose tower factually faces directly west, for Webb to have painted this picture he must have been positioned on a western bank of the Oude Maas river, looking eastwards towards the church. As the painting clearly shows the sunlight illuminating the sky over what then must be the eastern horizon, behind the church, this painting could not depict an evening scene. If, however, this is an evening scene, then this church tower (if that is what it is), must be on such a western bank of its river, with Webb standing on an eastern bank. If this is somewhere in the Dordrecht/Rotterdam river system, then a search must concentrate elsewhere than the eastern river bank where the Grote Kerk stands. Wherever this place is, if it depicts an evening scene, with the sun setting in west, then Webb must have been standing on an eastern position looking west, which means that the church tower would be facing in an easterly direction. Architectural historians of Dutch church buildings might have an opinion as to whether this is likely. 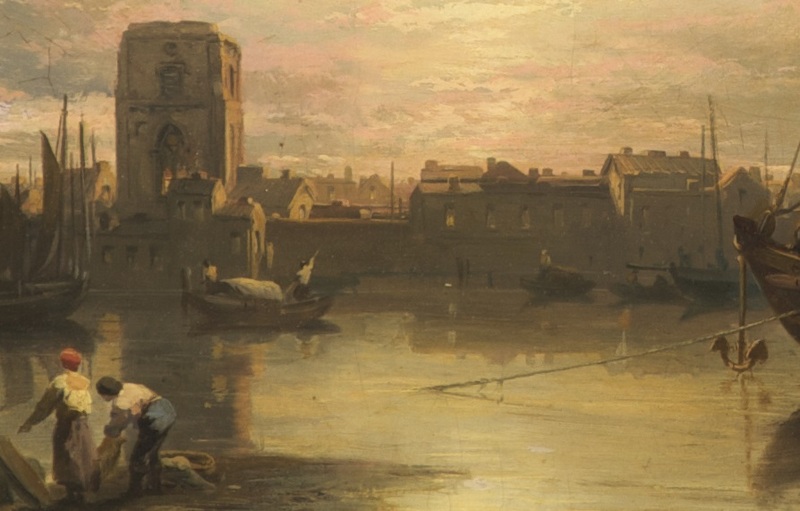 If it turns out that all church towers were usually positioned at a churche's western end, then this scene must depict a sunrise at the start of a working day on a river. It is possible, of course, that it is a complete work of fantasy, incorporating elements that just helped James Webb produce a pleasing image, one that was never intended to have either topographical or geographical accuracy. Oh, and the Veere church can be discounted for, although its tower is more of the shape of this discussion's one and is on the western end of its building, it is also on a western bank, and is surrounded by open countryside so has nothing of the population density depicted in this painting. Martin, regarding your comment today about Webb's sketches etc, please see the attached, which appeared in the Pall Mall Gazette of 27th March 1890. 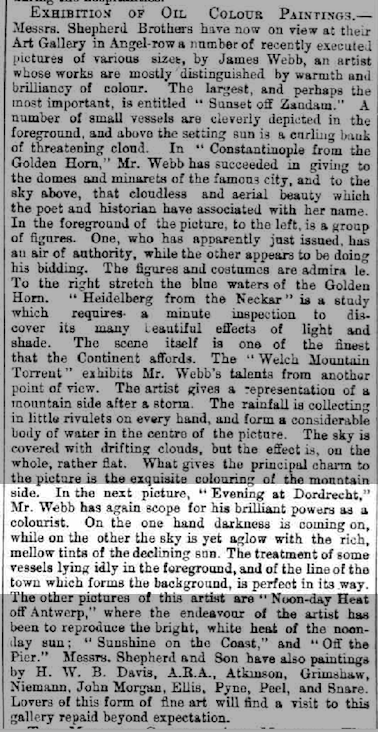 The attached, from the Nottinghamshire Guardian of Friday 26th January 1877, although describing what could be any one of his Dordrecht scenes, might be relevant. Marion, would it be possible to post the PCF hi-res of the entire scene? Very important details have appeared on the ones that you have so far posted but being able to examine the whole line of urban buildings might reveal some other interesting details. The PCF high-res image of the whole picture is attached. Andrea, that is an excellent find. The painting doesn't depict Dordrecht, but it could have been based on a view of Dordrecht. Webb visited Dordrecht and made several views of Dordrecht in which he counterbalanced a sailing vessel with the massive tower of the Great Church. It seems that he repeated this compositional scheme without being topographically accurate in any way. It might have been derived from Dordrecht sketches, but I think he turned it into a completely fictional skyline. 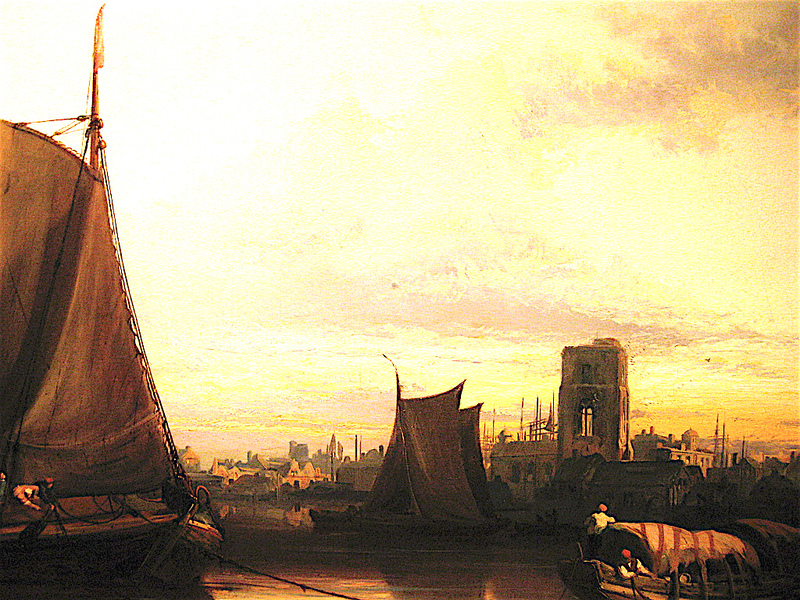 He might have been more interested in creating a river view with clear references to famous views of Dordrecht, such as Turner's renowned 'Dort or Dordrecht. The Dort Packet Boat from Rotterdam Becalmed'. 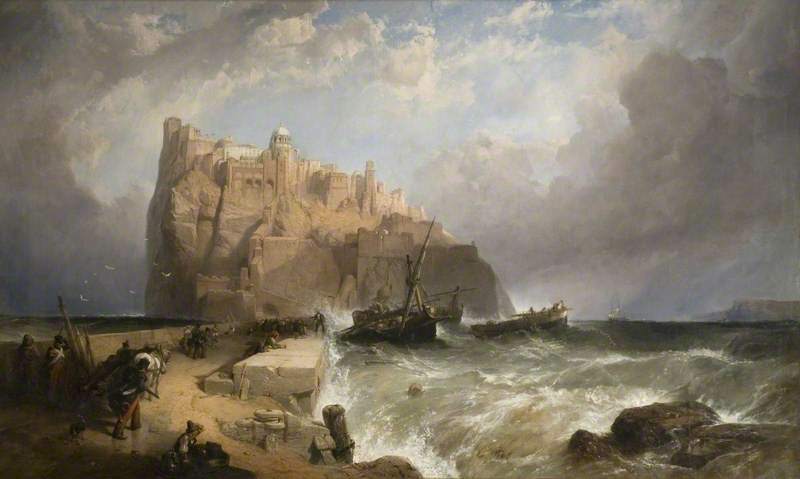 Webb's composition in reverse does immediately recall Turner's famous painting. The pier in low water towards the city (albeit without the reeds), the large ship waiting for the water to rise and the spectacular light all seem to be derived from Turner. The red flag looks similar to that of the Dordrecht packet boat 'the Swan'. The opulent paraphrasing might be more important than pinpointing an exact location. I'm moving in a similar direction: there's not a Dutch gable end to be seen, nor do the smaller boats have a recognizably Dutch look to me, though local knowledge might do better. The central, somewhat ruinous and small-scale church in the two finished pictures is not the Grote Kerk at Dordrecht however and the rearrangement of many of the background town features, including the mill which appears far left in the painting sold in 2009 and far right in the Rochdale one, suggest both are substantially 'capriccio' works based on Webb's visit(s) to the Netherlands, since no-one -including input from local knowledge - has been able to be more specific. It has also been suggested the church architecture is 'Brabant gothic' (ie possibly southern Netherlands). Even though only one of the large boats has a 'Dort' inscription I suggest that a better description might therefore be 'Evening scene: Dordrecht passage boats off a Netherlands river townscape' or ' 'Dutch [or 'Netherlands'] evening scene: Dordrecht passage boats off a river townscape'. The 'passage' - to anticipate queries -indicates vessels doing a regular run, usually for passengers as well as baggage and some cargo, with at least one end a fixed base be it as the port they belonged to or/and their regular destination. A familiar English equivalent would be the 'Margate hoys' that (until the coming of steam) did the regular run ending there from London. 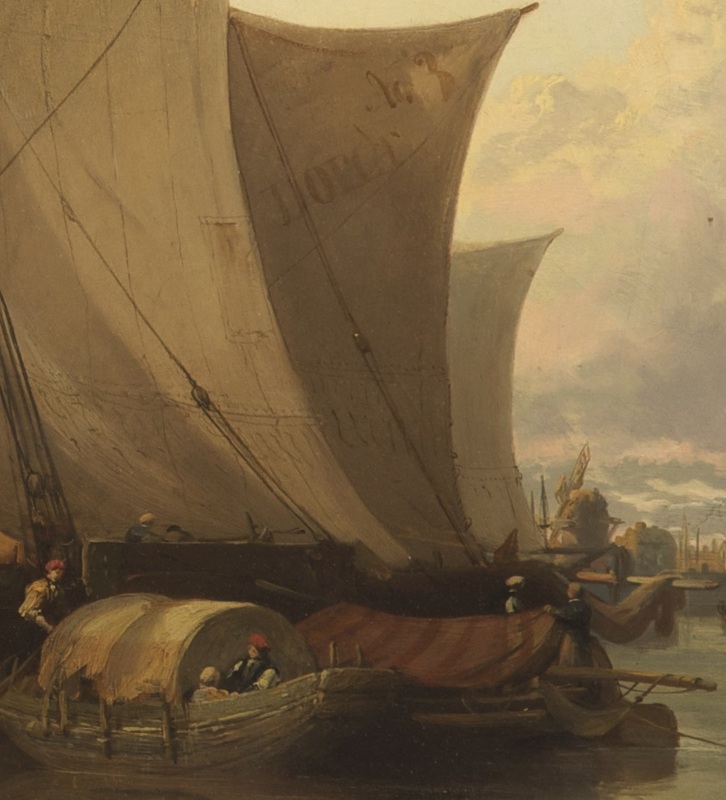 (Turner's 'Swan' becalmed off Dordrecht was another such).